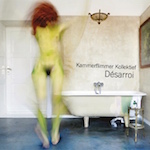 KK have been doing the rounds for a while now and ‘Désarroi’ is their tenth in total, which is no mean feat. Opener ‘Mayhem’ builds on a Free Jazz base; and whilst this might not immediately make you chomp at the bit, this four-piece have a few surprises up their sleeves. Whilst the instrumentation falls and stumbles haphazardly, there is a glue to the track in the form of synth, which stabilises the chaos brilliantly. Atmospherics are the order of the day; and each instrument is systematically relevant in producing its own ambience and being. The basses are rich, the guitars reverberate with mild overdrive and harmonies drone and soar amongst a bedrock of percussion. Subtle programming techniques warp the string instrumentation; and the welcome inclusions of backwards bows add an even flow and sea in which the listener can sail across. There are the more obscure numbers on here, which won’t sit well with some, as they didn’t with me and sometimes KK do have a tendency to just get wrapped up in themselves too much. However, more often than not there is much on here to be come engrossed in should your patience hold out.